Hi, I am interested in your 1965 Land Rover Series II listed on Autotrader for $24,900. I'd like to get more information about this vehicle and confirm its availability. 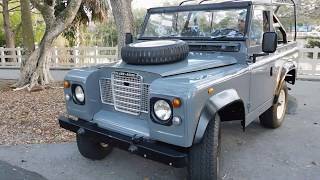 Up for sale is a beautiful 1965 Land Rover Santana imported from South America. Vehicle has been fully restored in & out and no expenses were spared! Interior is practically new, fresh high quality paint on the exterior. Perfect running condition, all electrical works as it should. Factory gauges all in working condition. Drives great! Mechanically 100%. OEM Land Rover canvas top is brand new! Not a cheap aftermarket but original Land Rover canvas top. Motor, and Transmission were rebuilt approx one year ago. Has electric Starter which is rare to see in these as it is a great upgrade! Brake Booster was added during restoration. No disappointments here! Clean & Clear Florida Title in hand. Ready to be enjoyed by new owner!